These two paintings deploy a complex symbolism derived from religious texts. They were possibly commissioned by a client for the purpose of meditation on Mary’s virginal motherhood and the Redemption. In the left panel we see the Virgin and Child in an enclosed, circular garden that can be related to the hortus conclusus of the Song of Songs. In addition, the figures are surrounded by symbolic motifs derived from the Old Testament and which refer to Mary’s purity, for example, the Burning Bush that burns without being consumed and the closed door of Ezekiel’s vision, referring to the speculum sine macula. The right panel has a more complex iconography in which the still living Christ on the cross leans to his right towards an image of the New Church surrounded by symbols referring to his role as Redeemer. This pair of panels formed part of a large ensemble of which the other subjects are now unknown. Within the Museum’s collection they are among the most iconographically interesting compositions as despite their small format they contain a large number of complex symbols. In the left panel the anonymous artist has emphasised the idea of Mary’s condition as virgin mother and on the right that of the concept of the Redemption of Christ. In the left wing the Virgin and Child are depicted surrounded by a series of attributes derived from the Old Testament, used to emphasise Mary’s virginity during and after the birth of Christ and which are to be found in other media such as sculpture from the 13th century onwards. 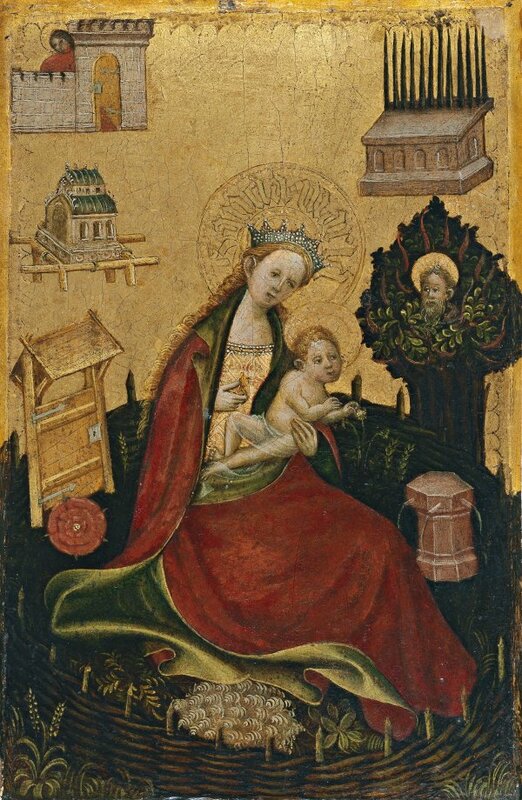 In the present panel the Virgin and Child are depicted seated in a schematic, circular garden enclosed by a small wooden fence with a gate. This is the hortus conclusus or closed garden referred to in the Song of Solomon, while the fountain on the right is the well of living water mentioned in that text. Next to the gate is a large, open rose that alludes to the Virgin as the rose without thorns. Outside the enclosure are other symbols referring to her virginity such as the bush that burns without being consumed, inside of which is the head of God the Father, again following the biblical text. Above it is Aaron’s staff flowering in the tabernacle while on the other side we see the Ark of the Covenant. The last symbol located against the gold background — a surface whose qualities can be related to the speculum sin macula — is the closed door of Ezekiel’s vision. In addition to her halo on which is inscribed “Lauda.Maria”, the Virgin wears a crown of pearls in reference to her status as queen of Heaven. The panel on the right emphasises Christ as Redeemer and is even more complex with regard to its iconography. The living Christ, still bleeding from his wounds, bends his body towards the new Church that has been born from his sacrifice. The dead wood of the cross returns to life from his blood and two shoots sprout from it. This cross is of a type known as “brachial”, terminating at its four ends with hands. At the top a hand holds a key that refers to the gateway of the heavenly Jerusalem; the bottom hand holds a mallet that inflicts blows on Satan in hell to indicate Christ’s victory over the Devil; the hand on the right holds a sword that defeats the old religion; while on the left the blessing hand indicates the new faith. 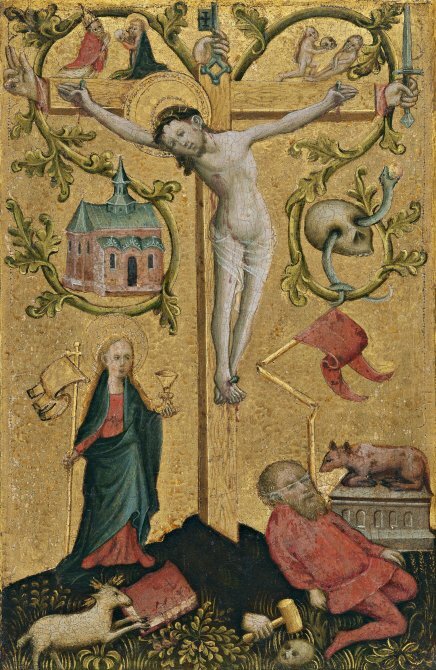 On the right beneath the cross the artist has depicted the old religion, symbolised by the Synagogue, depicted in the form of a vanquished old man with blindfolded eyes and with his legs and his standard broken, located next to the sacrificial altar. The skull, serpent and apple refer to Original Sin, again referred to in the images of Adam and Eve, the first fathers, seen at the top right with Eve presenting a skull to Adam. On the left of the cross the triumphant Church is represented through the figure of the Virgin who, as the new Eve, bears a chalice and banderole. Below her is the lamb of the Apocalypse who has the closed book with the seals. A model referring to the new church of Christ and above it the figure of Mary receiving communion from the Pope are the final messages on the left of the panel. The concepts expressed in this complex iconographic programme are to be found in theology and religious literature, although they may respond to the requirements of a particular client who would have indicated the desired contents to the artist. Whatever the case all the symbols in this work would function to inspire meditation and profound reflection in the faithful as each expresses complex theological concepts. Both panels entered the Thyssen-Bornemisza collection in 1929, having previously been in various private collections in Cologne, Sigmaringen and Munich.